This post brought to you by Libby’s. All opinions are 100% mine. Pumpkin is one of my absolute favorite foods in the world. It’s also one of the few vegetables that I like. 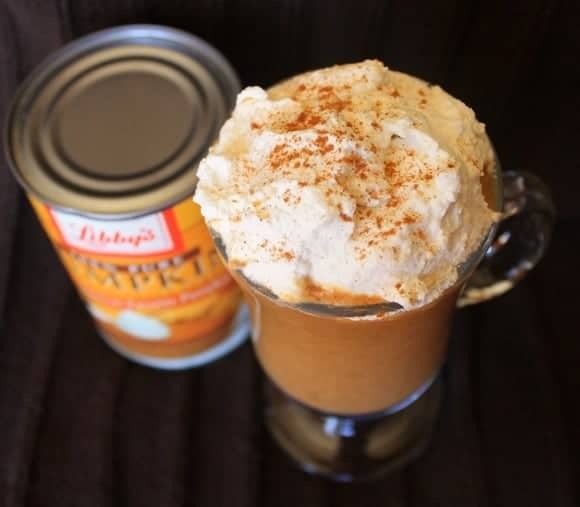 While most people think of this superfood as a staple for fall desserts, thanks to Libby’s Pumpkin, you can enjoy the flavor year round! Since smoothies are a staple for me in the spring and summer, I thought it would be fun to try a pumpkin smoothie recipe! Share your favorite #PumpkinCan Facts for a Chance to Win! I adapted this recipe from the Libby’s Pumpkin website. The recipe below makes 6 servings. You can trim it down for individual smoothies though. Put everything except the cinnamon in a blender and blend until smooth. Top with whipped cream and sprinkle with cinnamon. 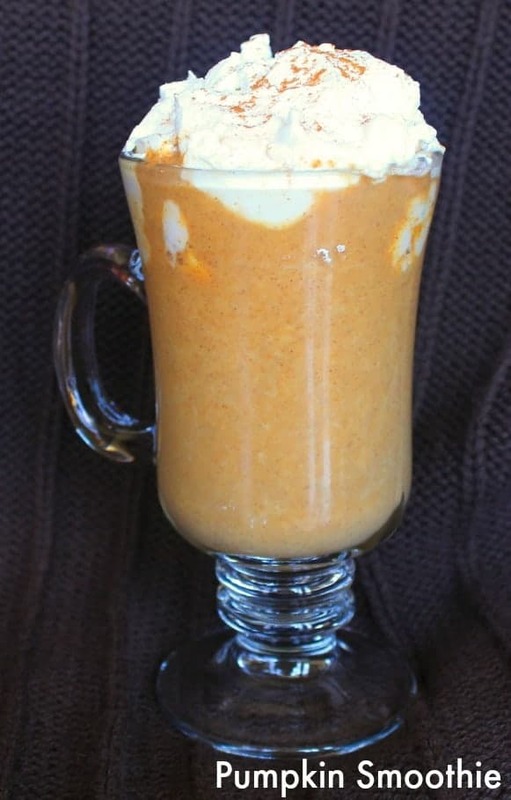 This pumpkin smoothie recipe is delicious any time of the year. It’s especially refreshing in the warmer months. Pumpkin is packed with fiber and Vitamin A. It is an excellent way to reduce the fat and sodium in some of your favorite recipes. For example, you can stir it into jarred sauces to add thickness and boost flavor, or into your next batch of brownies (pumpkin brownies are sooooo yummy!). I even plan to make some pumpkin ice-cream this summer! I was planning to make it for you now, but I didn’t realize I needed an ice-cream maker for the recipe. I have one on the way though! Did you know that pumpkin isn’t just great for people? We’ve used it for our pups to help keep their coat shiny and in our baked dog treats. Seriously, it’s just a super-amazing super food. 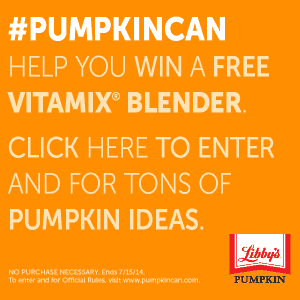 As if enjoying the delicious flavor of pumpkin year round isn’t enough to make you go out and grab a can of Libby’s Pumpkin, now you have the chance to win some great prizes too! Visit the Pumpkin Can website and share your favorite #PumpkinCan fact on Pinterest, Facebook or Twitter for a chance to win a Vitamax Blender and other prizes. Check out Libby’s on Facebook and Libby’s on Twitter for more news! 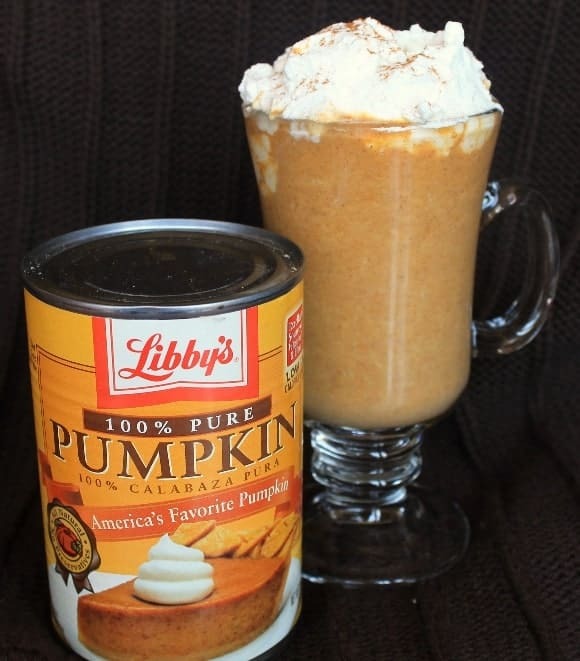 Follow Libby’s on Pinterest for great recipes! What is your favorite way to enjoy pumpkin year round? Have you ever tried a pumpkin smoothie recipe? I stocked up on pumpkin when it went on clearance after Thanksgiving so I need LOTS of recipes…looks yummY! Can’t say I’ve had a pumpkin smoothie before. Can see it as a nice Halloween treat! I love pumpkin but I never thought to have it in a smoothie! I love it in a coffee drink so this makes sense! Cannot wait to give it a try! I never thought of it either until I saw the recipe. I thought it looked super easy (I’m all about the easiest recipes) and I’m so happy I gave it a try!